Lahontan Auto Racing Association (LARA) considers it a PRIVILEGE, not a right, for any competitor/participant to compete/participate in any Rattlesnake Raceway Event. The general rules section applies to each and every competitor, mechanic, and pit personnel. If you have a question, ask an Official. You're expected to know the rules. Ignorance of the rules is no excuse for failure to comply. The rules and/or regulations set forth herein are designed to provide for the orderly conduct of racing events and to establish minimum acceptable requirements for such events. All racing competitors are deemed to have read and comprehend these rules, and will comply with their content. No express or implied warranty of safety shall result from publication of, or compliance with these rules and regulations. These rules, in no way, are a guarantee against injury or death to participants, spectators, or others. NO UNSAFE CONDITION WILL EXIST. ANY UNSAFE CONDITION IDENTIFIED BY THE TECHNICAL INSPECTOR, RACE DIRECTOR OR ANY LARA TRACK OFFICIAL WILL BE FIXED IMMEDIATELY OR THE CAR CANNOT COMPETE. Any person involved in an accident or injured while on the racing premises must report to a track official before leaving the premises in order to be eligible for insurance benefits (provided such person is physically able to make such a report). 1. LARA reserves the right to refuse admission to anyone. At the discretion of the track officials, any competitor may be disqualified for rule violations, hazardous equipment or hazardous actions. All disputes must be presented to a track official in writing by the end of the race night. LARA will make every attempt to notify ALL parties involved with of any written protest received as to allow said parties to discuss their case to the LARA Board at the next meeting. LARA's Board of Directors will make a final decision and the party/s will be notified of the Goard's decision. The Board's decision is final. 2. Drivers will assume responsibility for the actions of crew/family/friends. (regardless of where persons are located). A minor driver under the age of 18 will be accompanied by a parent/guardian when dealing with track officials. Fighting, interfering with a track official/security or threats of violence may result in automatic disqualification and/or suspension from racing at Rattlesnake Raceway. The use of profanity or profane gestures at anytime towards any person or officials shall not be permitted. Violators may be removed from the raceway. Repeat offenders may be suspended for the season. Any and all individuals in the pit area shall at all times follow the requests fo track officials. Refusal to comply, regardless of the individual's opinion, may result in fine, suspension, or expulsion. 3. Pit Admission: LARA track officials have the right to revoke this authority (Pit Admission) at anytime that it is deemed that a person's presence or conduct is not in the best interests of the sport. Unauthorized presence at Rattlesnake Raceway is considered trespassing and violators are subject to the penalties prescribed by law. All participants, pit crews and spectators are required to fill out all appropriate forms and pay all required fees including any possible unpaid fines, BEFORE entering the pit area. All person’s must sign for themselves. NO EXCEPTIONS. All pit area person’s shall be required to obtain a valid wristband in order to access the pit area. The wristband shall be placed on the wrist snugly in order to disallow removal of the wristband. All persons not in possession of a valid wristband shall be escorted out of the pits. Minors 17 years and under, must have a parent or guardian prepare/complete and sign a minor’s release form. ANYONE UNDER 14 YEARS OF AGE MUST BE ACCOMPANIED BY AN ADULT AT ALL TIMES IN THE PITS!!!! All participants, 17 and younger, must have a notarized minors release form on file with LARA. Minimum Driving age is 16 years of age. Drivers under age 16 will be considered by LARA's board members on a case by case basis, as well as driver experience. Any driver failing to fill out all appropriate forms/waivers and pay all required fee's including unpaid fines shall forfeit all points/prize money for that race event. NO EXCEPTIONS! Any attempt to circumvent pit registration as listed is subject to expulsion. 4. Once a person has paid entry into the pit area, there shall be NO PIT REFUNDS MADE. Any refund exceptions will be decided by the DOC. A check written to LARA and returned by the bank due to insufficient funds needs to be paid in cash or a money order, and include a $35.00 bank service charge. 5.LARA allows the courteous and careful use of three/four wheelers, and motorized pit bikes within the Pit Area as push vehicles, equipment transportation or personal transportation. No recreational use is allowed. Car number and class must be placed on three/four wheeler for visual identification. (i.e. : HS-6, IMCA 21, etc) No ID = No use. Authorized age limit to operate pit vehicles is 10 years of age and older. Operators under 10 yrs old, must have an adult riding with them. Excessive speed, reckless operation or no identification will result in the loss of authorization to use three/four wheelers. Riding on race cars, tow/push vehicles is not encouraged. 6.The Pit Area is for the preparation of cars for competition. All drivers must operate their vehicles within the Pit Area in a manner that is safe and under control. The Pit Area is not a test area. Drivers/spectators/crew members are responsible to watch for pedestrians and other vehicles and exercise caution. The Pit Steward will control all traffic entering the track. Failure to observe the directions of the Pit Steward, excess speed or reckless driving may result in disciplinary procedures. When entering the pits from the track surface, drivers must slow to a speed no greater than 5 MPH. 7.All drivers will be required to have in their pits, a 2 pound dry chemical fire extinguisher. All crew members must be aware of its location, and knowledgeable in the use of the fire extinguisher. 8.Alcohol is not allowed to be present and visible in the Pit Area before or during a racing event. Alcohol may not be consumed in the Pit Area until after the final checkered flag of the last race of the night. There is no tolerance with the possession and/or use of drugs on the racetrack property at any time. Any person suspected of being under the influence of alcohol and/or drugs will be asked to leave, and could be subject to disciplinary action based upon the discretion of the race officials. IF any driver is suspected of being under the influence of alcohol and/or drugs, and has/is operated/ a race car, LARA officials will notify law enforcement for possible legal action. If driver is arrested and convicted, the driver and crew may be subject to a lifetime suspension. 9. Race teams are allowed a tow vehicle and trailer inside the pits. Please be considerate and park your race car in line with your trailer. Non-tow vehicles may park in the pits at the cost of $5.00 per vehicle. Vehicles will be insured and insurance cards must be presented when inquired for by a track official. Track officials can refuse non-tow vehicle parking in the pits if space is required for more race teams. Refunds will be made to non tow vehicles if they have to be removed for space. 10.A driver is allowed substitute drivers, with the Board's discretion. Substitute drivers must be approved by the board prior to the scheduled event and must be in the original driver’s original car. The points will go to the car for those approved races. If a Rookie driver needs a substitute driver it must be another Rookie driver for that class. 11. The car that the driver starts with in the heat race must be used in the main event. If a back-up car is used in the main event, driver will start last for that event. 12. LARA track officials reserve the right to inspect a race car at anytime. LARA officials reserve the right to disqualify any driver and/or race car from competition. It is the responsibility of the driver and crew to disassemble the race car for inspection when requested to do so. Refusal to comply may result in disqualification and forfeiture of prize money and points. 13. Any car under protest taken from premises without first clearing it with the tech official, may subject car and driver to disqualification, forfeiture of prize money and points. 14.Any driver under suspension may not participate in any LARA sanctioned event, until further written notice from the President. 15.All drivers, owners and mechanics assume full responsibility for any and all injuries sustained including death and property damage at any time they are on the premises, in route there to or there from. Owners, drivers and pit crew agree the track is in safe condition if they take part in racing activities. Approval of a race car by the inspector shall mean ONLY that it is approved for participation in a competitive event and shall not be construed in any way to mean that it is guaranteed mechanically sound, safe or completely legal. LARA and/or the inspector shall not be liable for any mechanical failure nor for any losses, injuries or death resulting from the same. 1. GREEN: Official start of race. A driver does not have to take the initial green flag to enter a race. 2. YELLOW: CAUTION!! WE DO NOT RACE BACK TO YELLOW! Slow down and form a single file line. You will not go down a lap under yellow. Any driver causing a yellow flag condition will be sent to the back of the pack on the restart. Any driver causing a caution prior to a re-start will be sent to the back. In the instance where both drivers were at fault, both drivers will go to the back of the pack for the restart. Any driver causing two (2) yellow flags in one race will be Black Flagged. A self-invoked spin-out to avoid an accident will not be considered a spin-out. A driver leaving the track under yellow flag will be given two (2) courtesy laps to return to the event. The courtesy laps will start counting when the last car leaves the track. Any car leaving the track for any reason during a heat race, will not be allowed back on the track. Any car leaving the track for any reason during the main event, will start at the back of the lineup regardless if the race has started or not. Remain in a single file line while scorekeepers confirm lineup is correct or track officials correct the lineup. The flagger will signal drivers to cross up. When drivers have received the one-to-go signal for a re-start, any car/s leaving the track will not receive the two courtesy laps. 3. RED: Stop as safely as possible! SHUT OFF ENGINE! Failure to stop and shut engines off, may result in a penalty. This lap will not be scored. Do not get out of your car unless it is on fire. Do not re-start your engine or move your car until the yellow flag is displayed. Do not leave the track under a red flag unless directed by a track official, then proceed to the tech pad. You must wait on the tech pad until the track is under yellow. You/your pit crew can access the damage to your vehicle; however no work can be done until the track is under yellow. If repairs are made, you will be disqualified. NO EXCEPTIONS. VIOLATION OF THIS RULE MAY RESULT IN DISQUALIFICATION! 4. WHITE: One lap before checkered flag. If a leader of a race receives the white flag and a condition causes the track to be placed under yellow, that race will be called. The finish line up will be from the last completed lap. 5. CHECKERED: Race is complete. Drivers are allowed one (1) cool down lap and then must exit the track. At the end of your race, take one cool down lap and then leave the track so the next race can start. Anyone taking more than one cool down lap could receive the black flag for that event, except victory lap. 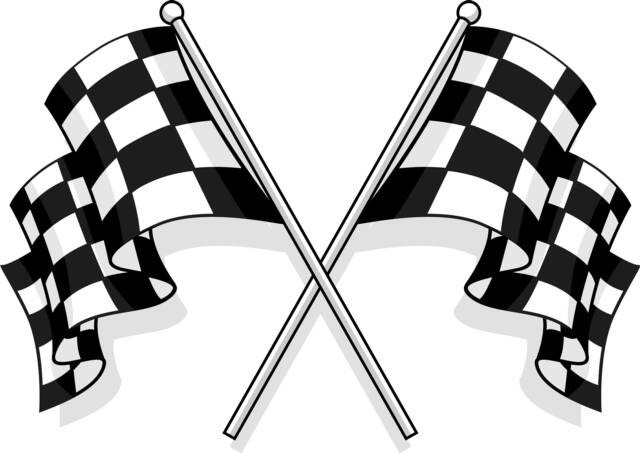 Drivers may take a victory lap by picking up the checkered flag from the Pit Steward. 6. RED and YELLOW: Complete restart. Go back to original starting positions, with the exception of the driver who caused the yellow. 7. ROLLED UP BLACK FLAG: Warning for rough/aggressive/out of control driving, intentional or unintentional, of vehicle. Next incident may result in full black flag. 8. BLACK: A full black flag may be received without a warning. Driver must leave the track immediately and may be disqualified with loss of points and money for that event. Driver must proceed to the tech pad. A track official will inform the driver of the cause. No one is allowed on the tech pad at that time. You may not be allowed to return to that event. If you do not leave the track, a yellow flag will be thrown. You will be directed off the track. If you refuse to leave, a red flag will be thrown and you may be towed off the track. Under either of these conditions, you will be subject to discipline as determined by the LARA board. 9. BLACK WITH ORANGE DOT: Mechanical problem with car. Driver must leave the track immediately. Once the problem is fixed, driver may return. Mechanical flag will only be given twice to any driver. If flag is not adhered to, driver will be given the black flag and will not be allowed to return to that event. 10. BLUE WITH ORANGE STRIPE: Used to notify drivers that lead cars are approaching. Hold your line. Do not move up or down. If you are not up to track speed, you must drive as close to the wall as possible. This flag will be used at the discretion of the flagman. If a driver should abuse or continually disrespect these flags when given, corrective action may be applied by LARA's board of directors. 1. All cars must be neatly painted. 2. Take pride in your car. Cars should be washed prior to race day. Tech may refuse to inspect car until it has been cleaned. 4. All classes may use two digits and must be in compliance with above rule #3. All numbers must be of a contrasting color from the color of the vehicle. Senior LARA member's have priority for their numbers. If they do not register their number by March 31st, of each race season, those numbers are open to anyone who applies for them. (Except retired numbers). Non-member drivers from out of town with the same number as a LARA member, will be assigned a letter by the tech inspector. If your number cannot be instantly recognized, the car may not be allowed to compete. Track officials will make the decision with the tech inspector. If numbers cannot be easily read by the scorekeepers, the car may not be scored. 5. Driver’s name must be on roof above driver’s and passenger's doors. The #4 in memory of Dave Banovich, Sr. and Dave Banovich, Jr.
To run any of these numbers you need to get written permission from the respective families. 1. All cars must start, move forward and backward without assistance at time of pre-tech. 2. In no class shall electronic traction control devices be used. 3.Raceivers are mandatory in all classes. Drivers must have this device on their KART and working during all events of the evening. If a person is found to be using a scanable raceceiver, they will be disqualified for the entire night. No in-car communication devise can be used at any time. 4.Transponders are mandatory in all classes. Drivers may purchase their own or they may rent one from LARA. All transponders must be securely mounted to the steering post closest to the driver seat. If drivers purchase their own transponder, be sure to inform officials so that they may enter the transponder into their scoring system. 5.Failure to comply with both the raceiver and transponder rules may result in not being scored, removal from the track and/or fines/penalties. 6.Packing the track will be done at the discretion of the DOC and Flagman. Drivers must wear appropriate racing attire while packing the track. The procedure for wheel packing will be single file, no spinning tires and top to bottom formation. 7.Hot lapping is optional, and at the discretion of the track officials. Hot laps will be by class. Pit crews are allowed to hot lap vehicles provided they have a pit pass and appropriate racing attire. 8.All drivers must attend the driver’s meeting prior to racing in that day’s events. Pit crews are also encouraged to attend. Roll call may be taken prior to meeting starting. NO EXCUSES/EXCEPTIONS. IF YOU ARRIVE LATE AND MISS THE MEETING, YOU WILL START YOUR HEAT AT THE BACK OF THE PACK. 9.Drivers must be aware of the race line up. When called to stage, all cars must do so IMMEDIATELY. If you are late to the line-up, you will start at the rear of the field. Arguing with the Pit Stewart will not be tolerated and could be subject to disqualification for that event. 10.Upon entering the racing surface, you will remain lined up in the order of the start of the race. The pole position car will maintain a parade lap speed, not fast, but not slow. If the track has just been watered, the flagger may motion the drivers to speed up and work it in. Do not do so unless motioned to. 11.Any driver who delays the start or restart of any event may be sent to the back of the pack. No stopping on the track will be allowed. Do not stop on the track to protest a call or ask questions to a track official. Stopping may result in being disqualified, with the exception of informing a track official of a track safety hazard/condition. 12.OUTLAW restarts are used at this track. An outlaw re-start is when the first position goes out by itself, second position goes to the inside behind the leader and third position will move to the outside behind the leader and so forth all the way back through the field. The leader can pick a high or low line. You cannot pull along side or pass the leader until after the green flag has waved. All lapped cars/traffic will be lined up at the back of the pack on restarts. 13.Pay attention to the track lights in turns 1, 2, 3, and 4. When all lights are out, be prepared for the start/re-start of the race. Traffic light relates to track flag condition. i.e. : Green Light = Green Flag. 14.If a driver jumps a start, the track will go green and then back to yellow. The driver will be charges with a caution and will be sent to the back of the pack for the next re-start. 15.All drivers starting a race must exit turn two for a race to be considered an official start. However, the DOC or flagger may call for a re-start at any time during the first lap. Once a race has been declared an official start, or the event has used its two complete re-starts, the next start will utilize an outlaw re-start formation. 16.If caught in a wreck, stay in your vehicle, unless it’s on fire. If you are not injured, lower your window net to show officials that you are OK. The track will go red for any driver that hits the wall, roll over or a multi-car wreck. All drivers must be aware that track officials will be coming to your aid. Do not drive away in a manner that will endanger rescue crews. Do not leave the track without your car unless you are instructed to go with the safety crew. Leaving your car is an automatic disqualification from that event. 17. Heat race line ups are by pill draw. Main event line ups (except IMCA Modified) are at the discretion of the DOC with the 1st and 2nd in points and the winner of the last main event in the back. If you win a main event and miss a race, when you race again you will start in the back. 18. Rookie drivers must identify their cars. All rookie drivers will display a red ribbon mounted securely on the rear down tube of the roll cage. The tail of the ribbon must exit the rear window. This must be displayed for the entire first season. You may petition for its removal to track officials based on driving skills. 19.A driver whose car is destroyed may race another car, with the same number, and keep all previous points. If a car is bought or sold to another driver the points for the car will be reset to zero. 1. Tech inspector and DOC have the right to change classification of any vehicle at any time. 2. Drivers are required to pass their car through safety/tech for each event prior to driving on the racetrack. Safety/tech pads are located at the top west corner of the pits just as you leave the track exit. Safety/tech officials will normally begin inspections two hours prior to first race time. 3. A Tech Inspection Sheet will be used. If your car does not meet technical rules, you may be issued a repair citation. You may be allowed a grace race that night. If the safety equipment fails, you will not be allowed to race until repaired/replaced. All citations must be cleared prior to next tech inspection. It’s driver's responsibility to clear citations. 4. If a car has been cleared for race day, any driver may drive that car as long as he starts the race in that car. If you change drivers for the main event of the racing night, the car will start last. A driver may drive in more than one (1) class. You must pay for both cars/classes when signing in at the pit gate. 5. POST MAIN EVENT INSPECTIONS: All classes are required to have the top four (4) cars go DIRECTLY to the tech area at completion of each event. Failure to go directly to tech area may be disqualified. Only driver and car are allowed in tech area. One crew member can be standing by for tech assist if required. Crew members and/or spectators must NEVER approach and/or touch a racecar that is in post tech until OK’d by Tech Inspector. 6. If track officials determine after the main event, that a vehicle does not meet applicable specifications, officials have the right to impose a penalty which may result in disqualification. If a disqualification occurs, driver may lose any/all points and money for that event. 1. A procedural protest must be in writing and filed with a track official by the end of the race night. The protest must be specific in alleged violation to determine whether protest is allowed or rejected. One item per protest, per event only. All protests will be filed individually and must be accompanied with a $40 cash deposit, $10 of the deposit will be retained by the track for administration. If item being protested is found legal, the entire deposit will be forfeited. If found illegal, $30 of the deposit will be refunded to the protester. 2. Technical/mechanical protests must be presented in writing to the Director of Competition, (DOC) along with a $200 protest fee (cash only), no later than 30 minutes after the conclusion of the Main Event in which the protested car is competing. Only drivers competing in their class may protest cars within that class (i.e. a driver is Pro Stock may not protest a Hobby Stock, etc.). The protest document will describe specifically and fully what is being protested. The DOC may defer the tear down to minimize the damage done from dirt at the racetrack. However, steps will be taken to ensure that the evidence is not destroyed or altered. In all cases the inspection will take place before the protested car is allowed to compete again. Protested cars found to be within the prescribed limits will result in the presentation of the protest fee to the owner of the car being protested. If the car being protested is found to be illegal, the car and driver will be disqualified for that nights events and suffer the loss of all points and money earned. Any disqualified driver may be assessed an additional fine, additional loss of drivers’ points and possible race suspensions as decided by the LARA board members. All illegal items must be corrected in accordance with LARA class rules prior to racing. If fines are assessed, the car will not be allowed into the pit until all fines are paid. A driver may not protest more than one car per event, and may not protest the same driver more than once per race season. Drivers may not join forces to file a protest against another driver. The party against whom the protest is made has a right to know the charge and have a written copy thereof so that they may adequately defend themselves against any action. You must be a member of LARA to receive Rattlesnake Raceway points and qualify for the point’s championship at the end of the year. Membership dues must be paid before or on the first (1st) night of racing for the current season to earn competition points towards the championship. An award will be given to the drivers of all classes finishing the season in the top 10 positions or discretion of the LARA Board of Directors. A. Trophy/Cash dash- No points will be awarded for the dash. If there is a tie in the points of any class, the tie breaker will go to the driver that has won the most mains, then heats. If that does not break the tie, then the drivers will race off during the Dirt Track Championship event. Each competing member driver of LARA must throw out their worse race of the season BUT may not be a DQ or BF event.